Posted by Ada Wang on 11/28/2018 1:55:03 PM. Perhaps you have got used to the refreshing experience of Windows 8 Metro and the prettier interface of Kindle for Windows 8 app. However, when you plan to remove Kindle DRM on the Windows 8 computer for reading Amazon Kindle AZW / TPZ / PRC / MOBI books on a non-Kindle eReader such as Nook, Kobo or Sony, or simply for totally possessing the purchased Kindle titles independant from Amazon Server, you are likely to find it a little difficult. However, there are no Kindle content files stored under Kindle for Windows 8! Generally, there are two ways to remove Kindle eBook DRM: by inputting Kindle device serial No. or by syncing with Kindle app on the computer. (You can read the detailed guide here: Kindle DRM Removal, Easily Remove Kindle DRM AZW) KSN only works on books downloaded on E-Ink Kindle devices and does not succeed every time, therefore syncing with Kindle app on computer is a recommended way. Since there are no Kindle books under Kindle content folder on Win 8, how can we find out the downloaded Kindle content files so as to remove Kindle DRM on Windows 8? Update on 9/10, 2015: Now you can also try to remove kindle drm on Win8 online. Where are Kindle eBook files stored on Windows 8 computer? I searched on the Internet and got the information below. 1You may find the downloaded Kindle content files under the default "My Kindle Content" folder. Readers who find Kindle content files under the default path may have installed Kindle for PC app instead of Kindle Windows 8 app. This can be out of other reasons as well. For Kindle app, Package Name is AMZNMobileLLC.KindleforWindows8_************ and the 12-char ************ depends on individuals. Other chances are that Kindle Win 8 app uses a new storage method, which stores Kindle books under the cache folder and each Kindle book file comes with several fragment files such as 1.fragment and 2.fragment. Don't be upset if you can't find Kindle content files in cases above. You can still achieve your goal by going back to Kindle for PC app. People who have found synced / downloaded Kindle eBooks on the Win 8computer can skip Step 1 & 2 below. As with installing a traditional desktop app on Windows 8, you can press "Windows" key on the keyboard to switch to desktop interface. Press the key again to go back to Win 8 startup. Step 1: Download and install Kindle for PC app on Windows 8 PC. The given download link is for the US users. If your Amazon account belongs to another country, please download Kindle for PC app there (such as http://www.amazon.co.uk or http://www.amazon.ca). Select "Kindle" -> "Free Kindle Reading Apps" -> "Windows 7, XP & Vista" under "Computers". 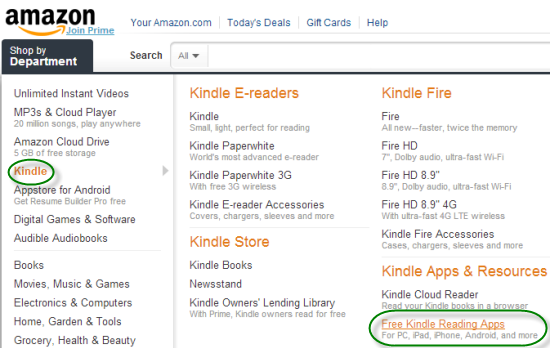 Step 2: Register the Kindle for PC app with your Amazon account. You will be asked to do so the first time you launch the app. Once the registration is done, all Kindle books purchased under your Amazon account will be synced soon and display under "Archived Items" shelf. 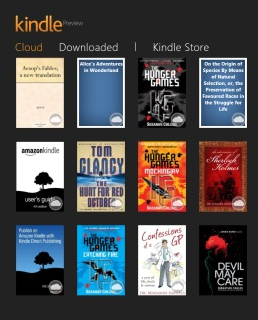 Head to Archive Items, double-click each book to download and make sure you can read the books with Kindle Win 8 app. Refer to Paragraph 2 to get the path of downloaded Kindle content files. Step 3: Download and install Epubor Ultimate. Run. Select free trial please. All Kindle books will be detected automatically and only the first 10 DRM-protected books will be DRM removed. If you want to remove DRM from certain books, create a folder for the two books and click "Setup" -> "General" -> "Customize" to set the input path yourself. If the Kindle books are not auto imported, click "Setup" -> "General" -> "Customize" to set the input path. Step 4: Click "Remove DRM" button. You will find the Amazon Kindle eBooks DRM removed from your Windows 8 computer within minutes. Feel free to try this on other Win 8-running devices like Surface Pro. After succeed in decrypting Kindle books with Epubor Kindle DRM Removal, you can consider buying the full version. If you think above methods are hard to follow, maybe firstly you can try this free online Kindle drm removal. Visit the site on your Win 8 from your browser, then follow its guide. 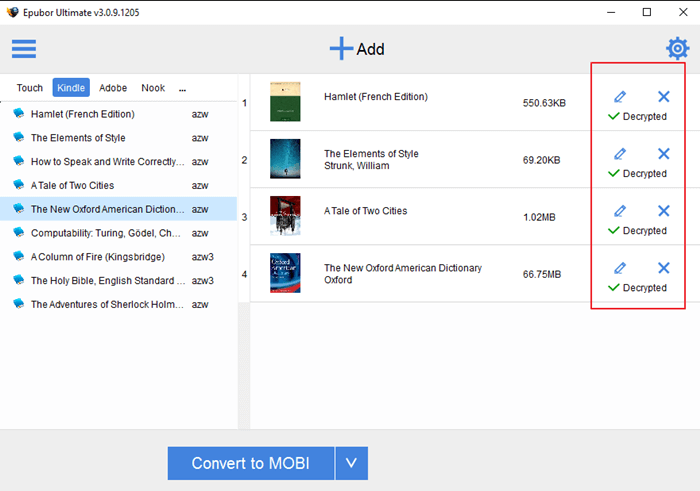 Here I need to notice you that if you want to try this method, make sure you already have an Kindle Paperwhite or Kindle Voyage because the drm removing job is based on the KSN. I have Wondows 8.1 RT, and after searching for my Kindle books for hours, I discovered they are fragmented. It wont let me download the Kindle for PC from amazon site, only from Windows app store. I also cannot download the drm removal software. how do I get around this? My tablet no longer supports Audible, and I'd like to choose my own reader. Suggestions? I've updated this article, add a new method to help you remove drm on Win 8. 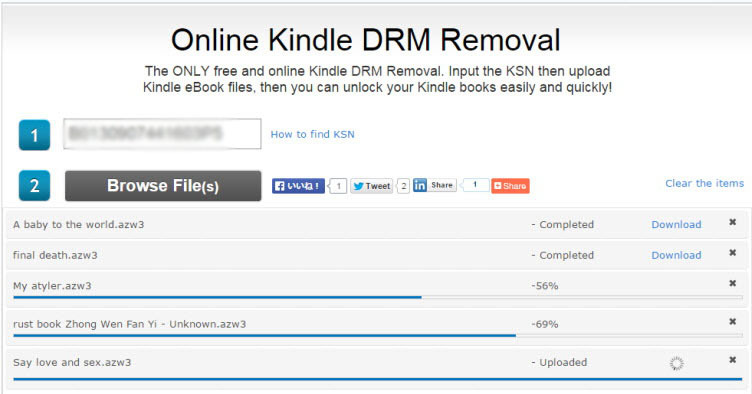 Now you can remove drm from kindle books online. But this method demands you had an e-ink already. I have tried what u posted with no effect and the hole kindle for win7 doesn't exist anymore. Any other suggestion? all of the above does not work. What do you do with Windows 10? All the files downloaded appear to be in "fragments" so now what? Please download Kindle for PC and sync Kindle files via it. Then you will get the normal format Kindle books, not "fragments" . There isn't a kindle for PC app anymore. Only windows 8. Is there anyway to combine the fragmented files, and then convert them? Seems like without a kindle device, there's no way to access the .azw file. Not helpful in the least to just repeat what is written above. Let me know when you get win 10, and try to run your software again. Open Calibre, Add Book/s and done.